You do not talk about Anonymous. Anonymous works as one, because none of us are as cruel as all of us. Anonymous does it for the lulz. Anonymous cannot be out-numbered, Anonymous out-numbers you. Anonymous is a hydra, constantly moving, constantly changing. Remove one head, and nine replace it. Anonymous reinforces its ranks exponentially at need. 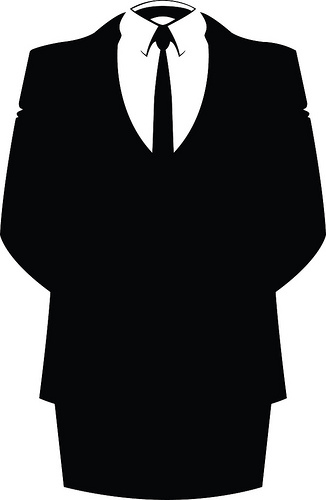 Anonymous has neither leaders nor anyone with any higher stature. In this section we’re breaking the first two rules of the Sekrit Code of Anonymous <encyclopediadramatica.com/index.php?title=Anonymous&oldid=1998440936#The_Sekrit_Code>. When others have done this in the past it has brought down the wrath of this shadowy group of anonymous individuals, causing public humiliation, hacked servers, and other florid forms of chaos. Anonymous is a collection of individuals that post anonymously on /b/ <img.4chan.org/b/>, a section of the image board 4chan.org. When you post content on a typical message board, you are often required to enter your name. If you don’t, your entry is attributed to “anonymous”. On /b/ everyone posts as “anonymous”. The collective actions of users identified with the name anonymous aggregates into the collective identity Anonymous. “Hello, Scientology. We are Anonymous. Since then, Anonymous has mounted repeated electronic attacks on Scientology websites, coupled with large scale protests outside of Scientology centers across the world. Throughout this large scale, coordinated, goal oriented collective action no one has emerged as the leader to speak for the group. In fact, no one has spoken to the press at all, though the press has reported extensively on the events. The only communiques come in the form of anonymously posted videos and anonymous posts to /b/ with instructions for when to protest, how to conduct yourself during the protests, what to wear, etc. In this book we attempt to articulate what constitutes a collaboration. We argue that rules for participation, established guidelines for attribution, organizational structure and leadership, and clear goals are necessary for collaboration. In most cases, when we think of these attributes, we think of manifestos of artist and activist groups, attempts to govern attribution by formal licenses like the Free Culture and Free Software licenses, Debian’s formal decision making process, or Eric Raymond’s notion of a Benevolent Dictator that characterizes Linus Torvald’s governance over Linux. What is fascinating about Anonymous, is that at first glance, it appears they have none of these: They are often portrayed as a band of predominantly young white male renegade hackers raining chaos on random corners of the Internet with no logic or reason. They have even been called Terrorists. But in fact, their Sekrit Code establishes clear rules. Participation requires posting as Anonymous and not talking about Anonymous. Attribution is strictly collective and anonymous under a unified group identity. The organizational structure is clear: There are no “leaders nor anyone with any higher stature.” The code even establishes goals: “the lulz” adapted from “LOL”, in short, for kicks. Anonymous has operated under rules that are directly opposed to the rules that have governed most successful large-scale collaborations. How then do goals as broadly defined as “the lulz” become defined and articulated into a goal like the intent to “systematically dismantle the Church of Scientology”? How can an organization with no leaders articulate and execute such an ambitious and “long, long campaign”? How can the enforced absence of any structure as a governing principle result in such effective and coordinated action? Is this a possible collaborative future? If so, it is a terrifying one in which anonymity and structurelessness permits total absolution of social responsibility, terrorizing of innocent outsiders, and harassment of those who provide public feedback, criticism and indeed even speak of the group (“You do not talk about anonymous”). It is a P2P, collaborative, digitized “Lord of the Flies” wherein boys’ games devolve into violence for fun. In the perpetual techno-utopian dialectic, this is the feared dystopian future we hope will be avoided, as we aim for the utopia that we can never actually arrive at. P2P: The Unaccepted Face of Cultural Industry? Can Design By Committee Work?